All this actions cause user interaction in some cases. A KParts derived class representing a text document. The Document class represents a pure text document providing methods to modify the content and create views. A document can have any number of views, each view representing the same content, i.e. all views are synchronized. Support for text selection is handled by a View and text format attributes by the Attribute class. To load a document call KParts::ReadOnlyPart::openUrl(). To reload a document from a file call documentReload(), to save the document call documentSave() or documentSaveAs(). Whenever the modified state of the document changes the signal modifiedChanged() is emitted. 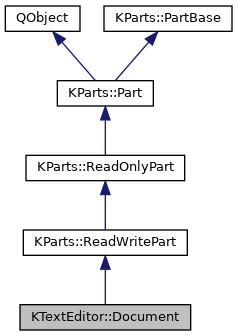 Check the modified state with KParts::ReadWritePart::isModified(). Further signals are documentUrlChanged(). The encoding can be specified with setEncoding(), however this will only take effect on file reload and file save. Get the whole content with text() and set new content with setText(). Call insertText() or insertLine() to insert new text or removeText() and removeLine() to remove content. Whenever the document's content changed the signal textChanged() is emitted. Additional signals are textInserted() and textRemoved(). Note, that the first line in the document is line 0. A Document provides full undo/redo history. Text manipulation actions can be grouped together to one undo/redo action by using an the class EditingTransaction. You can stack multiple EditingTransactions. Internally, the Document has a reference counter. If this reference counter is increased the first time (by creating an instance of EditingTransaction), the signal editingStarted() is emitted. Only when the internal reference counter reaches zero again, the signal editingFinished() and optionally the signal textChanged() are emitted. Whether an editing transaction is currently active can be checked by calling isEditingTransactionRunning(). The signal editingFinished() is always emitted when the last instance of EditingTransaction is destroyed. Contrary, the signal textChanged() is emitted only if text changed. Hence, textChanged() is more accurate with respect to changes in the Document. Never change the Document's contents when edit actions are active, i.e. in between of (foreign) editing transactions. In case you violate this, the currently active edit action may perform edits that lead to undefined behavior. A View displays the document's content. As already mentioned, a document can have any number of views, all synchronized. Get a list of all views with views(). Create a new view with createView(). Every time a new view is created the signal viewCreated() is emitted. A Document may be in read-only mode, for instance due to missing file permissions. The read-only mode can be checked with isReadWrite(). Further, the signal readWriteChanged() is emitted whenever the state changes either to read-only mode or to read/write mode. The read-only mode can be controlled with setReadWrite(). A Document has the ability to show a Message to the user in a View. The Message then is shown either the specified View if Message::setView() was called, or in all Views of the Document. To post a message just create a new Message and send it with postMessage(). Further information is available in the API documentation of Message. When the system or the application using the editor component crashed with unsaved changes in the Document, the View notifies the user about the lost data and asks, whether the data should be recovered. This Document gives you control over the data recovery process. Use isDataRecoveryAvailable() to check for lost data. If you do not want the editor component to handle the data recovery process automatically, you can either trigger the data recovery by calling recoverData() or discard it through discardDataRecovery(). A simple document represents text and provides text manipulation methods. However, a real text editor should support advanced concepts like session support, textsearch support, bookmark/general mark support etc. That is why the KTextEditor library provides several additional interfaces to extend a document's capabilities via multiple inheritance. More information about interfaces for the document can be found in Document Extension Interfaces. Definition at line 195 of file document.h. Create a new document with parent. Pass it the internal implementation to store a d-pointer. Definition at line 26 of file document.cpp. Definition at line 32 of file document.cpp. Warn anyone listening that the current document is about to close. At this point all of the information is still accessible, such as the text, cursors and ranges. Any modifications made to the document at this point will be lost. Warn anyone listening that the current document is about to reload. Get the character at text position cursor. the requested character, or QChar() for invalid cursors. Get the git hash of the Document's contents on disk. The returned hash equals the git hash of the file written to disk. If the document is a remote document, the checksum may not be available. In this case, QByteArray::isNull() returns true. Remove the whole content of the document. Create a new view attached to parent. Get the default style of the character located at position. If position is not a valid text position, the default style DefaultStyle::dsNormal is returned. Further information about the colors of default styles depend on the currently chosen schema. Since each View may have a different color schema, the color information can be obtained through View::defaultStyleAttribute() and View::lineAttributes(). If recover data is available, calling discardDataRecovery() will discard the recover data and the recover data is lost. If isDataRecoveryAvailable() returns false, calling this function does nothing. End position of the document. The editor part should provide some meaningful name, like some unique "Untitled XYZ" for the document - without URL or basename for documents with url. This signal is emitted whenever the document name changes. A Range which encompasses the whole document. Definition at line 688 of file document.h. The user will be prompted by the part on changes and more and can cancel this action if it can harm. true if the reload has been done, otherwise false. If the document has no url set, it will just return false. The user will be asked for a filename if needed and more. Save the current file to another location. The user will be asked for a filename and more. This signal should be emitted after a document has been saved to disk or for remote files uploaded. This signal is emitted whenever the document URL changes. This signal is emitted also for editing actions that maybe do not modify the document contents (think of having an empty EditingTransaction). If you want to get notified only after text really changed, connect to the signal textChanged(). Get all available highlighting modes for the current document. Each document can be highlighted using an arbitrary number of highlighting contexts. This method will return the names for each of the used modes. Returns a list of embedded highlighting modes for the current Document. Get the current chosen encoding. The return value is an empty string, if the document uses the default encoding of the editor and no own special encoding. Get the end cursor position of line line. Definition at line 719 of file document.h. Return the name of the currently used mode. Get the highlight mode used at a given position in the document. Retrieve the name of the applied highlight mode at a given position in the current document. Calling this might trigger re-highlighting up to the given line. Therefore this is not const. Warn anyone listening that the current document's highlighting mode has changed. Return a list of the names of all possible modes. Returns the name of the section for a highlight given its index in the highlight list (as returned by highlightModes()). You can use this function to build a tree of the highlight names, organized in sections. Insert line(s) at the given line number. Returns whether a recovery is available for the current document. Check whether an editing transaction is currently running. Returns if the document is empty. Definition at line 127 of file document.cpp. Check whether line currently contains unsaved data. If line contains unsaved data, true is returned, otherwise false. When the user saves the file, a modified line turns into a saved line. In this case isLineModified() returns false and in its stead isLineSaved() returns true. Check whether line currently contains only saved text. Saved text in this case implies that a line was touched at some point by the user and then then changes were either undone or the user saved the file. In case line was touched and currently contains only saved data, true is returned, otherwise false. Check whether line was touched since the file was opened. This equals the statement isLineModified() || isLineSaved(). Get whether cursor is a valid text position. column >= 0 and column <= lineLength(column). The text position cursor is also invalid if it is inside a Unicode surrogate. Therefore, use this function when iterating over the characters of a line. Get a single text line. Get the length of a given line in characters. Get the count of lines of the document. Warn anyone listening that the current document's mode has changed. Returns the name of the section for a mode given its index in the highlight list (as returned by modes()). You can use this function to build a tree of the mode names, organized in sections. This signal is emitted whenever the document's buffer changed from either state unmodified to modified or vice versa. True, eg if the file for opening could not be read This doesn't have to handle the KPart job canceled cases. was there some problem loading the file? Definition at line 99 of file document.cpp. Error message if any problem occurred on last load. Definition at line 104 of file document.cpp. Post message to the Document and its Views. If multiple Messages are posted, the one with the highest priority is shown first. Usually, you can simply forget the pointer, as the Message is deleted automatically, once it is processed or the document gets closed. If the Document does not have a View yet, the Message is queued and shown, once a View for the Document is created. true, if message was posted. false, if message == 0. This should result in showing the print dialog. Shows the print preview dialog/. Read session settings from the given config. This signal is emitted whenever the readWrite state of a document changes. If recover data is available, calling recoverData() will trigger the recovery of the data. Emitted after the current document was reloaded. At this point, some information might have been invalidated, like for example the editing history. document the document that was reloaded. Remove line from the document. Remove the text specified in range. Replace text from range with specified text. Definition at line 109 of file document.cpp. Searches the given input range for a text pattern. Searches for a text pattern within the given input range. The kind of search performed depends on the options used. Use this function for plaintext searches as well as regular expression searches. If no match is found the first (and only) element in the vector return is the invalid range. When searching for regular expressions, the first element holds the range of the full match, the subsequent elements hold the ranges of the capturing parentheses. Set the encoding for this document. This encoding will be used while loading and saving files, it will not affect the already existing content of the document, e.g. if the file has already been opened without the correct encoding, this will not fix it, you would for example need to trigger a reload for this. true on success, or false, if the encoding could not be set. Set the current mode of the document by giving its name. Set the given text as new document content. Get the document content within the given range. block Set this to true to receive text in a visual block, rather than everything inside range. the requested text part, or QString() for invalid ranges. The document emits this signal whenever its text changes. the requested text lines, or QStringList() for invalid ranges. no end of line termination is included. Get the count of characters in the document. A TAB character counts as only one character. This signal is emitted whenever the document creates a new view. It should be called for every view to help applications / plugins to attach to the view. This signal should be emitted after the view constructor is completed, e.g. in the createView() method. Returns the views pre-casted to KTextEditor::Views. Get the word at the text position cursor. The returned word is defined by the word boundaries to the left and right starting at cursor. The algorithm takes highlighting information into account, e.g. a dash ('-') in C++ is interpreted as word boundary, whereas e.g. CSS allows identifiers with dash ('-'). If cursor is not a valid text position or if there is no word under the requested position cursor, an empty string is returned. the word under the cursor or an empty string if there is no word. Get the text range for the word located under the text position cursor. If cursor is not a valid text position or if there is no word under the requested position cursor, an invalid text range is returned. If the text range is valid, it is always on a single line. the Range spanning the word under the cursor or an invalid range if there is no word. Write session settings to the config. See readSessionConfig() for more details about available flags.